two ingredients. one happy camper. I've mentioned many times that I'm a berry girl. I love all berries. Especially fresh (and locally) picked raspberries. But with blackberries literally a few steps away from my backyard, these juicy guys have a place in my heart as well. In fact, I've included some photos of blackberries and even made a blackberry roly poly out of them as well. Anyway, since I have to wait six months until blackberries come around again, I've been stuck eating the frozen store-bought ones. Which just aren't the same. 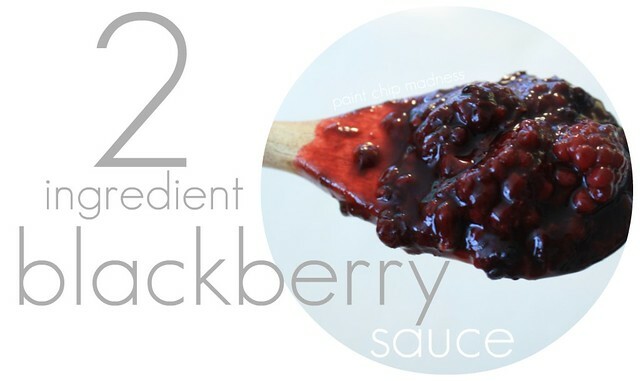 So I decided to make a blackberry sauce instead. With only two ingredients. The best part of this sauce? The fact that it still has pieces of whole berries (as opposed to a sauce where the berries are completely cooked down and disintegrated). note: I'm sure fresh blackberries work just as well, I just haven't tried making sauce with them yet. note: The amount of sugar you use depends on the sweetness of the berry and the sweetness preferences of the cook. 1. After berries have thawed, pour half of the bag into a pot. Turn the stove onto medium high. Add sugar, and stir. 2. Once berries have cooked down (takes about five-ten minutes depending on how frozen the berries are), add the rest of the berries. Stir gently (to prevent them from falling apart) and turn off heat after a couple minutes when the berries are no longer frozen. 3. Here comes the fun part, take a little taste. In my last (store-bought) version, I had to turn the heat back on because it was super sour (I added more sugar and turned off the heat once sugar dissolved). If perfect, let it cool and store in the fridge.